I was in Kentucky last week where I spoke to an audience of health care providers and advocates about the success of the state’s Medicaid expansion and the giant step backwards its pending waiver proposal would be. I was relieved that the state’s pending waiver proposal wasn’t approved while I was there as my trip coincided with CMS Administrator Seema Verma’s appearance last week at the National Association of Medicaid Directors. 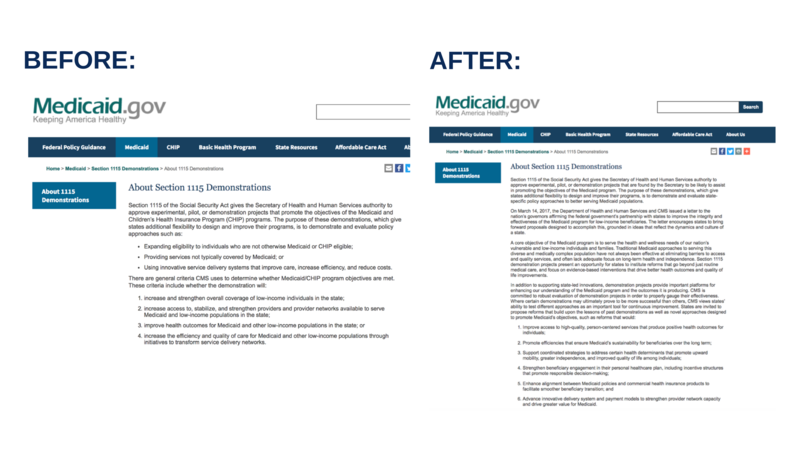 Verma outlined the Administration’s new philosophy on the role of Medicaid and followed up with action particularly with respect to Section 1115 waivers as it removed “covering more people” as an objective of Medicaid waivers and made other changes on CMS website. CMS also issued new process guidelines for both 1115 waivers and 1915 waivers and state plan amendments. As readers of SayAhhh! know, Verma’s major policy speech about her vision for Medicaid included other troubling aspects and factual errors – one of which my colleague Andy Schneider blogged about the other day so I will focus more on the fact that covering fewer people seems to be a clear goal of this Administration. Kentucky’s waiver proposal is likely to be the first one approved that will meet that objective. Kentucky’s Medicaid expansion has been critical to the state’s success in reducing the state’s uninsured rate for both adults and children and numerous studies have illustrated its health benefits. For adults, the uninsured rate declined from 20.6 percent in 2013 (prior to implementation of the ACA) to 7.1 percent in 2016 – one of the sharpest declines in the country. The uninsured rate for children in Kentucky also improved during that time period – from 5.9 percent to 3.2 percent – ahead of the national average of 4.5 percent. Yet Governor Bevin, who ran on the now all too familiar refrain of repealing the Affordable Care Act, has a sweeping proposal to make changes to the state’s Medicaid expansion that, according to the state’s own projections, would eliminate coverage for almost 100,000 adults in Kentucky’s Medicaid program in the fifth year of the waiver’s implementation. The state doesn’t really say this out loud, but it is clear when you take a look at their enrollment projections that from the basis of their budget neutrality submission and do the math. This coverage loss is likely to disproportionately affect rural areas of Kentucky, which have seen enormous benefit from the Medicaid expansion. We have lots of data on this you can check out here, but one amazing factoid here is that six of the ten counties nationwide with the largest share of Medicaid enrollees is in Kentucky. One of the most notorious ways Kentucky will cut coverage is through the proposed work/community service requirement that it is widely expected to be approved by CMS soon. Less well known, but equally if not more pernicious in my view, is a 6-month lockout period for those who fail to report a “change in circumstance” such as a slight fluctuation in earnings within ten days. This would result in loss of coverage, a civil or criminal penalty (not yet determined) for fraud (!) and a six-month lockout from coverage. Given that low-wage workers often experience fluctuations in income due to shift work, changing hours, seasonal employment and other features of the low-wage economy, this is a huge burden to place on these workers and no doubt will result in coverage losses and lockouts. Increasing bureaucratic barriers to coverage and imposing lockouts and severe penalties on low-wage workers who miss a deadline for reporting income fluctuations are also inconsistent with the rhetoric we’ve all heard from this Administration about helping working people and cutting red-tape. By the way, both of these provisions will likely result in substantial administrative costs that don’t get factored into “budget neutrality” equations in waiver agreements. So, in other words, Kentucky could wind up spending more money to cover fewer people. Helping people find jobs is a good thing as a societal objective. But Medicaid is a health insurance program, not a job training one. The work requirement is a misguided policy that won’t result in lowering unemployment rates but will lead to loss of Medicaid coverage. As I blogged about a while back, Indiana’s own evaluator predicts that approximately 25,000 people will lose coverage as a result of the work requirement the state is seeking to impose. But it is not just the work requirement that is at issue here – punitive lockouts are also being pursued by Indiana. When people lose coverage, their health care needs don’t go away. They are just less likely to access primary and preventive care and needed treatments like prescription drugs, leading to worse health outcomes and trips to the ER. And to my mind, making people uninsured is clearly not an objective of the Medicaid program – and as such waiver policy that heads in that direction is fundamentally flawed.